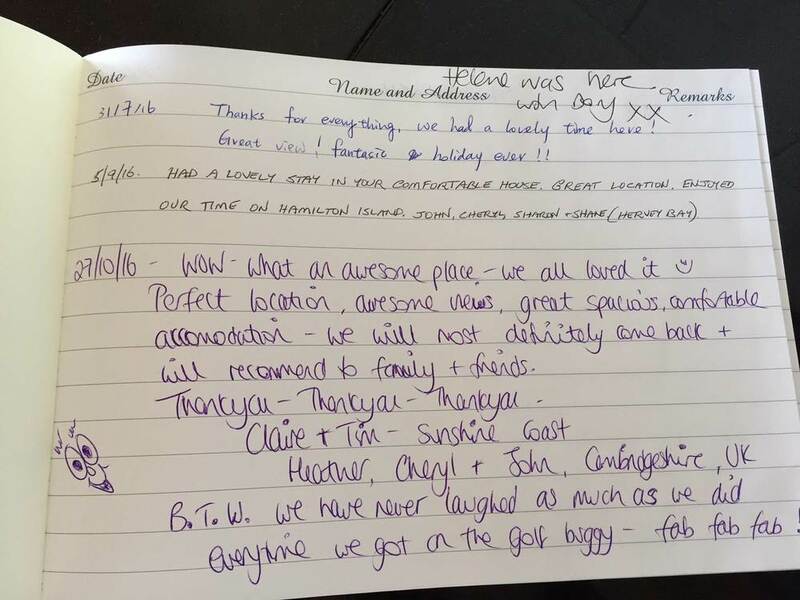 These are just some of the comments made by our guests. Thank you for another wonderful holiday.Hamorent you make everything so easy. It was great having our friends staying next door to friends over the New Year period.The apartment was larger than I expected. Very nicely decorated. View from the back doors was amazing.Air-conditioning in living area and bedrooms was nice and cool.Brand new buggy was awesome to get around the island on.I am sure we will be back real soon. We had an absolutely wonderful time on Hamilton Island all with the amazing organisation and communication that Hamorent provided. Due to Cyclone Debbie our original booking of a house had to be changed as it had to be repaired, therefore Hamorent provided us with a beautiful apartment with stunning views... from being picked up from the Marina to check-in and check-out was stress free.. would definitely recommend Hamorent to everyone - can't wait to go back - see you soon! Thank you, we had a lovely stay at Hamilton island. Thank you for organising our stay. Just spent 5 nights on Hamilton Island with Hamorent and have to say it was the one of the cleanest and well equipped apartments we have ever stayed in. 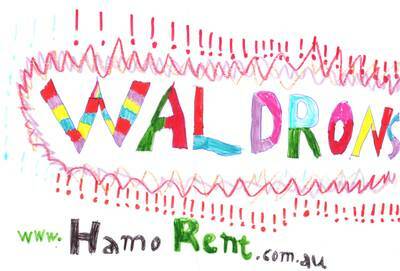 The service received was excellent and we would recommend Hammo Rent to anyone! Our entire Hamilton Island experience was brilliant and can't wait to come back before too long. We really enjoyed our Hammo stay. The new IGA supermarket is fantastic as were all the staff. Thanks again to you and your team. I keep preaching to everyone that Hammo is so affordable when you book through you guys and cater a bit for yourselves. Hammo really is my happy place, I just love it! Just wanted to say a big thank you for such a great place to stay on Hamilton Island. The process couldn't have been any easier. You met us at the airport with the buggy, gave us a quick familiarisation tour of the island, and checked us into our room. Our room was beautifully appointed, spacious, light, bright and airy. We couldn't have asked for more. 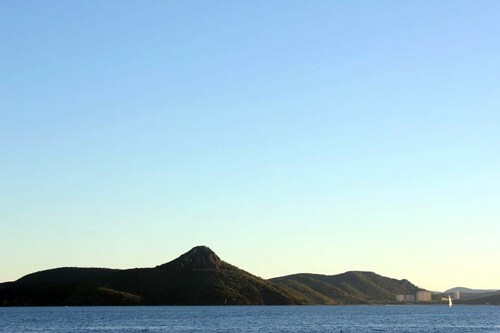 We are already planning our next trip to Hamilton Island and will most definitely be booking through HamoRent again. Your service and attention to detail is excellent. My family and I have just returned from our stay at Casuarina Cove 18. The apartment has beautiful water views and is conveniently located near the Marina. We received a lovely welcome onto the island by Cherry who met us at the airport and showed us around the apartment. The buggy included with the apartment was great! We had lots of fun exploring the island. Cyclone Debbie passed through Hamilton Island during our stay and we would like to express our gratitude to the HamoRent team. Cherry was very concerned with our wellbeing and patient with our questions. We heard a few horror stories about other accommodation on the island during the cyclone so we were happy we made the choice to book through HamoRent. We were well taken care of and appreciate all your assistance during the book process through to our stay. We have thoroughly enjoyed our stay in your apartment on beautiful Hamilton Island. We have ticked another item of our bucket list. Thank you. Will definitly coming back and telling our friends of this fabulous location. PS We loved the buggy to get around. A big plus. Very efficient organisation and very comfortable and clean accommodation. We have had a wonderful holiday on your beautiful island. Apartment suoer - we loved using the buggy. Our entire holiday experience was awesome and professional staff a pleasure to deal with at HamoRent and a wonderful apartment that was perfect for our family group. What a view and the buggy was great to explore the island. Hope to get back soon. Friendly, easy, convenient, clean and good value for money. 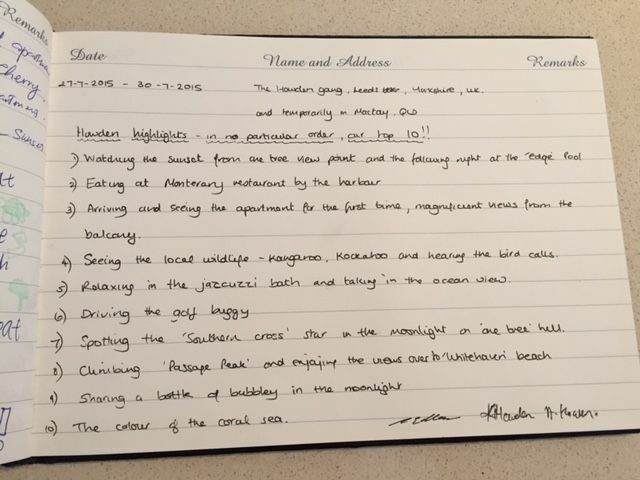 We have thoroughly enjoyed our first stay at Hamilton Island and with HamoRent. We will recommend this service and return to rent again soon (hopefully). We couldn't ask or want for more on our stay in paradise. Family had a fantastic stay on Hamilton Island, very clean, fully equiped beautiful apartment. Staff at HamoRent lovely and couldn't do enough. Thank you for a wonderful holiday, hope to return sometime soon. We had five glorious nights on Hamilton Island staying in the newly renovated apartment. It is luxurious and has the most amazing view from its huge balcony. If you do your research, you'll find that Hamorent is a great deal compared with other properties on the island. We enjoyed having full kitchen facilities and the peace and quiet that we might not have got at one of the nearby hotels. Hamorent is easy to deal with and its staff made sure check in and check out went really smoothly. Everything was excellent - Couldn't fault a thing. Location is perfect. Apartment spot on with plenty of space and had everything we needed. Hi Guys, We all had a wonderful time & will be back for sure ? Everyone has been so lovely and helpful, and it's the perfect family holiday. We would love to come back in the near furture please keep us in the loop for an specials. 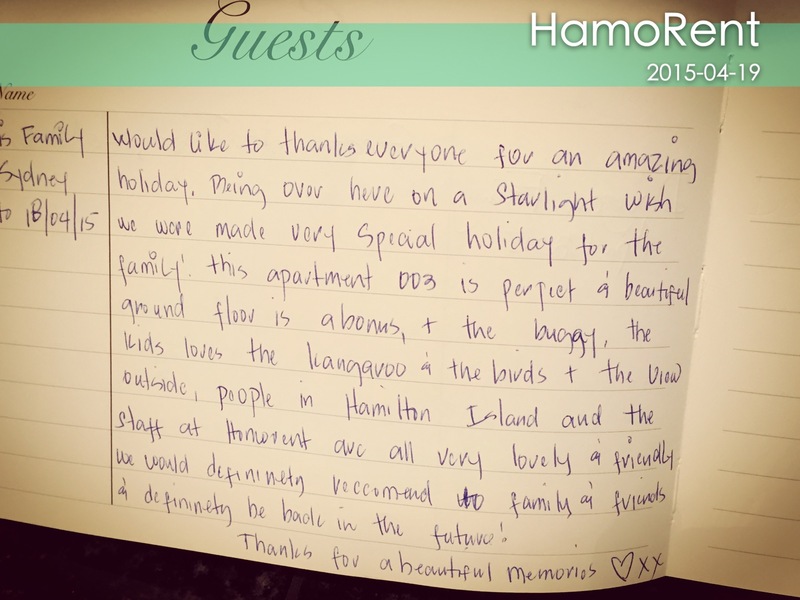 Thank you to Hamorent for professionally coordinating our stay on Hamilton Island. Your level of service and communication was very impressive and the apartment we stayed in was in excellent condition. The view was outstanding and the amenities, including the access to pools, BBQ's and the resort centre made for a memorable holiday for our family of five. We look forward to coming back to Hamilton Island in the near future. Well we are back in Auckland after our wonderful holiday and I'd just like to say that we all had a wonderful time on Hamilton Island!! The apartments were just great, the place was perfect, plenty to do, great food, perfect memories. The Hamorent people taht we met were helpful firendly and a pleasure to met. We can't believe how quickly our time there went but would have no hesitation in recommending Hamilton Island as a destination to our friends and Hamorent to deal with the bookings. Thanks once again for all your help and we all very much appreciate it. Overall a good package, thank you. You are no fuss, straight to the point company. We were very satisfied with HamoRent and thank you very much for making our holiday a fantastic one! The entire process was easy and efficient. Having a team on the island ensures the best experience possible. Location was perfect for our young family close to everything but quiet. The airport pick up was great, so much easier than having to get a bus especially with young children. Having baby gear included was terrific. Fantastic outlook, everything you need in a aholiday apartment. It exceeded our expectations. Staff were very welcoming on arrival as were the office staff. We had a wonderful holiday and already rebooked before we left. Great experience all round. Hamorent went that little bit extra to ensure we had a great holiday. Many thanks to all at Hamorent. See you next time. It was a great apartment and very well set out. Our last stay was superb. The apartment was very lovely with a great view. I like the fact that we were not disturbed with any garbage collection each day. The kids and oursleves loved the complimentary buggy it took a load off knowing it was there whenevere and included in the price. We recommend using Hamorent whenever you want to stay on Hamilton Island. Great service and care of accommodation. This was by far our best Hamilton Island experience - even considering that our bags were late arriving from Syndey. Excellent service, no faults. We had a wonderful time on the island and the apartment was perfect and the staff and owners were all very friendly and welcoming. We would definitly come back. Thank you for all your help in making our Hamilton Island stay such an enjoyable and memorable holiday. Thank you to the office staff Neri and Lucas. Thank you to Adam for the meet, greet and farewell and for being so patient with our 101 questions. Thank you to the 2 lovely ladies who came in to do the mid stay clean. Everyone involved was helpful and a pleasure to deal with. Our accommodation was supberb, the view was just wonderful, the choice in pools on the door step was a bonus and the water activities were a definite hit, as was the use of the buggy. We will definitely return for another holiday, hopefully soon. Good communication prior to arrival. Easy meet and greet service. Comfortable accommodation and great loaction. Lounge very comfortable. Buggy reliable (friends had trouble with theirs) Thanks and all the best - Happy to recommend your services to others. Its a nice island and a wonderful journey with memory. Will come again. Thanks for all services you provided. Second time we have used Hamorent very professional. No loose ends. Meet and greet man does an excellent job. Apartment presentation and facilities are excellent. Great Service. Unit was clean, well maintained and comfortable for all of us. It had everything we needed for the entire stay and hope to come back for another stay at this unit. Amazing service and a wonderful experience. Simply brilliant!! A big thank you from all of our family for an unforgettable holiday - Awesome! Pleasant stay, lovely views, no hassles with all services provided. Overall very posititive experience. Great service and friendly. We had aan amazing week here on Hamo, will def be coming back as you guys made it very easy to book through - very helpful, amazing service. I just wanted to say a huge thank you to you and your team on the ground on Hamilton Island for managing our stay. From the easy booking process and communication from Neri, through to pick up from the airport and arrival at our unit, to pick up and drop off back at the airport (loan of Lucas buggy which was very appreciated) the whole process was flawless and stress free. The quality of service that your team provided was exceptional! Please pass on our thanks to all concerned. Best wishes Graham, Jo-Anne, Alexandra and James. Thank you so mush we had the most wonderful time and we will definitly recommend you to all our friends or family. Hope to see you again soon. Just wanted to say how helpful I found the team at Hamorent whilst not only booking my holiday but throughout the whole holiday experience. Every query I had was answered quickly and dealth with very professionally. Thanks for much for making our holiday fabulous, we can't wait to return. Thank you so much for making our holiday a memorbale one. The apartment was breath taking. Our 13 year old will definitley remember her 13th birthday. I'm sure we will be back. Thank you so much. The unit has been fantastic, very happy. All up it has been awesome and of the 3 units our group had ours was definitly the pick and we'll be booking again! Very well organised and attentive staff. Our particular apartment was ideally situated with amazing views. Very comfortable, all the equipement we needed and very spacious. Having the buggy provided was a bonus. Beautiful location, facilities and great service. Flexibility with check in and check out is always appreciated. Thanks for a great stay. Race Week was a succes for all 14 of us thanks to Hamorent and the great weather. Your help in adjusting the apartments to suit us was appreciated. When we come back for Race Week next year we will definitly book our accommodation with you. Thank you Hamorent for a gorgeous apartment in a superb location. Shorelines was beautiful and the views from balconies were spectacular, especially at sunset. Rooms were clean and villa fully equiped. We loved Hamilton Island and the villa. Can't wait to visit again. Great service, value for money property, great views, friendly and helpful staff and people. Better than it looks in the pictures. Good value family accommodation. Buggy included, great service and great views. Fully self contained. Apartment was great and good value for money on Hamilton Island. This is a holiday we had planned and looked forward to for a long time and it certainly lived up to our expectations. Part of that was our accommodation. It had everything we needed and the most amazing views to boot. Hamorent really looked after us. Would like to say the unit was fabulous, great for heaps of family members. We had a great weekend and would definitly book again. Holiday on Hamilton Island was so amazing! Michaella and Chloe loved everything about it. The whole family had such a great time and it was very very relaxing. From my Family I would like to pass on my biggest thank you Starlight Foundation and Hamorent for giving us the opportunity to go away on a holiday to such an amzing place, we had such a great time and seeing Michaella with excitement and a very big laugh made us very happy parents. We can't thank you enough for making this possible for all of us. Starlight is so generous for the families like us that need it. Thanking you all for making such a beautiful holiday that me and my family will always remember. A quick note to say thanks to you and your team. We had the best time last week and the two units were great. Unfortunately 5 days went too quickly. 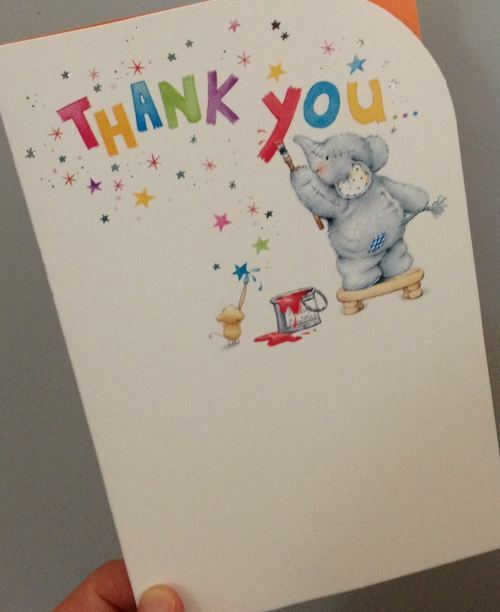 I was meaning to contact you sooner to thank you and your staff for your wonderful help and service. We were very impressed. Perhaps we will take advantage of the discount if we come back soon or pass it onto friends. Very impressed with our accommodation. The views were amazing. Good value for money, great service and use of the buggy. Thank you we will come again! Good position, and very nice inside. Good experience overall. Just back from a lovely 6 nights stay with HamoRent. The apartment was on the 3rd level with beautiful views over Catseye Beach. It was spacious and had everything you needed. The main bedroom has views the views from the balcony and opens up onto the balcony, the back bedroom has either 2 single beds or put them together to make a king size bed. They both have bathrooms (1 with shower and the other with both bath and shower.) A massive 50 inch TV in the lounge and a 40inch in the main bedroom. Kitchen has a centre eating area and dining table. Very handy washer and dryer. A buggy comes with the apartment and is great fun to get around on. The town is beautiful, quaint and the views over the marina is breathtaking. We could use all the pools and the busier one had a swim up bar in the middle. Beach was nice and sandy and the water was warm. We are so glad we chose that apartment and hopefully go back in the near future. Great experience ..... made booking accommodation on Hamilton Island easy (as it can be confusing). Great accommodation and facilites. Thank you for making our stay an enjoyable one... we will be back. Thank you for a great holiday!We had an aweosme holiday. The check in process was seemless and your staff are a pleasure to deal with. We were already planning our next visit before we left. Thanks again and we will be sure to book through Hamorent again. We had a great time and the apartment was fantastic for the 10nights, we were travelling with family members and they stayed in 3 other apartments and no complaints from anyone. We have a 3 year old and the ground floor at Lagoon Lodge was ideal. The apartment was clean and we made use of the BBQ most days. Having a full kitchen and fridge was also very convenient. In addition the island was fantastic and we made use of all the pools on the island. I would have no hesitation recommending the apartment and HamoRent and we will be back for sure. Now back in cool, rainy England and just wanted to say thank you to you and yoru team. You made the booking process easy, were friendly and flexible, and the greeting at the airport was great. Also a thank you to the owners for a well presented, comfortable modern apartment which lived up to expectations. We all wish we could return soon. A beautiful holiday even for the poor. A beautoful place to help you recharge your batteries for the world where you really live. A place never to be forgotten. A place where dreams can take place. A place where you can really pretend. A place everyone should come at least once in their life time. A big thank you to our granddaughter for inviting us there for her wedding. Just wanted to let you guys know your service to me and my family was nothing more than the best. We are planning our next trip with you guys around March. We had a wonderful time in our apartment, we greatly appreciated the sense of hospitality and welcoming by the owners shared with us. The unit has an excellent view, furnished generously and with style.We would love to come back and we are definitely be spreading the word amongst circle of family. We had an absolute ball and thank you and your crews help with picking us up both times and making sure our luggage was looked after. I am for sure coming back. Cherry was lovely when she picked us up from the airport and and very friendly. Love the stay and apartment as it was the last one on the end and on top floor also. Thanks very much and have already started telling people and planning a group visit. Just wanted to sya thanks for a great few days stay. The apartment, staff and buggy were all spot on! We will be back possibly with a bigger group!! Just wanted to say a big thank you for the accommodation, we had a fantastic time and the apartment was perfect. I was really impressed with everything including the timing of arrivals and departures. Thanks again it was an awesome holiday and we will be back! Our apartment was fabulous - everything you could need for a family holiday, light, clean and spacious as well. Perfectly appointed and well furnished. The HamoRent team were effecient and friendly. We will definitly stay again. We had an amazing time on Hamilton Island and can't wait to return. Would like to say a big thank you to all at HamoRent for the fantastic service we had from start to finish of our 10 day stay on Hamilton Island. The apartment was decorated beautifully and very comfortable, it had everything we needed, the only downfall the BBQ was a bit small for all of us. The buggy was fantastic. Thank you so much and we would not bother with looking elsewhere when we decide to come back. Thanks for your suggestions for our 30th Wedding Anniversary. The view was absolutely breathtaking, the apartment was all we hoped for and the buggy made sightseeing so easy. We loved everything and hope to return soon. 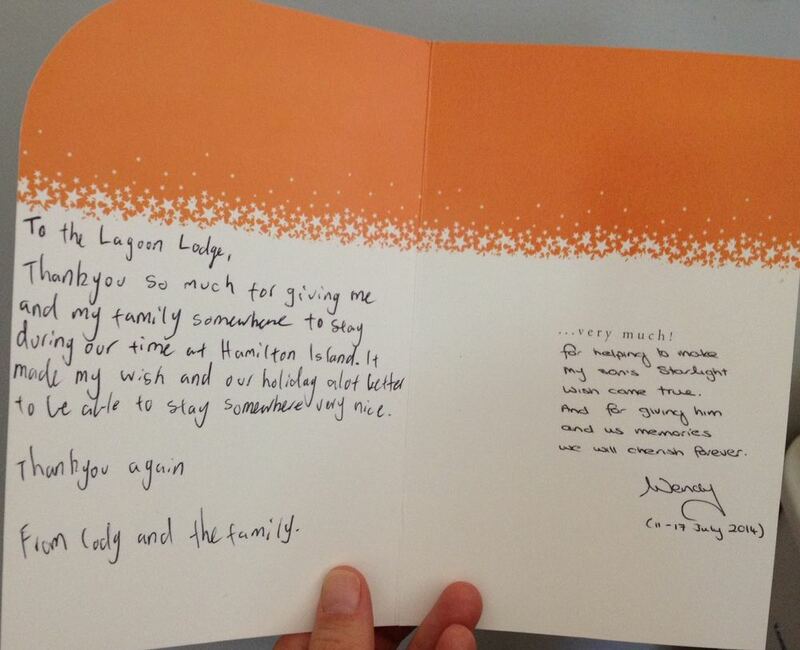 A quick email to say thanks for making our Hamilton Island trip a great experience. Once again we totally enjoyed the facilities and extra buggy you supplied, makes all the difference with our big family to get around. Once again thanks to you and your staff for a most memorable stay. Excellent company. The view from the apartment was amazing. Really friendly to deal with. Hamilton Island is amazing. We have used them a couple of times and never have a problem. Great service arrival to departure. Very easy to deal with and everything was the way I expected. Thank you Hamorent! The whole experience was great, met at the airport, shown around the apartment and in contact during our stay. The apartment had everything we needed, great outlook and convenient to all amenities. The buggy was a great way to get around. We would recommend this apartment and HamoRent to anyone wanting to come on holiday to Hamilton Island. Every detail was just as it should be. Perfect view with perfect facilities. Can't fault our stay here. My family recently stayed with HamoRent and boy let me just say, our stay was beyond perfect. Our 2 young children had the perfect little holiday with all the pools. Our room was perfectly clean! and the view was impeccable, from the moment we landed we were given the best service. Our valet girl was such a darl and took my very heavy suitcases up a heap of stairs and with a smile! My 2 girls loved her and even gave her a hug when we left. Definitly be back. Thanks for a great week. Was a great place for our big birthday celebrations. It was only our second time to Hamo and we wondered why it had taken so us so long to get back. To all staff. Many thanks for your hospitality. We found the apartment faultless and in a beautiful spot. All staff were friendly and helpful. If at all possible we will return soon. Had a great time and everything was perfect. Made our visit to the Island for our daughters wedding a very memorable occasion. Thank you for all your assistance. Thank you for your help with our stay at Hamilton, we had an absolutely fabulous time. The apartment was great, and we were so fortunate to have a stay with perfect weather - we didn’t want to leave! Thanks for a great stay in one of your Lagoon apartments. We had an excellent family holiday made very easy by your helpful & friendly staff.The apartment was in a great location with loads of room for the kids, we really loved the grass area out the front for the kids to play on too, happy kids = happy holidays!!! We had a great time, the weather was perfect and the apartment was spacious, clean and a great balcony with a big BBQ was a hit for breakfast and the dinner BBQ's, would recommend to one and all. Thank you, we enjoyed our time on Hamilton Island very much and would love to come back. We were very pleased with the apartment – the view is certainly beautiful and the room was very lovely. It was great to have the use of the buggy and to be met from the marina and then taken to the airport when we had to leave. The service was excellent! Thanks again. We would like to thank you for making our 50th wedding anniversary so memorable. We appreciated the complimentary bottle of bubbly which was enjoyed on the balcony with the superb views and amazing sunsets. We would have to say it was one of the most relaxing and enjoyable holidays we have had. As we have previously stayed in your apartments I can only say what a pleasure it is dealing with you and we will definitely be back again. We have no hesitation in recommending HamoRent to anyone. We thoroughly enjoyed our stay on Hamilton Island, booked through HamoRent. The website worked well for booking and staff were helpful when I phoned or emailed with queries. The pickup service to/from the marina and airport was on time and friendly. The apartment was very clean and well appointed. We found all the utensils needed for cooking in the kitchen and it was great to have a dishwasher and washing machine/dryer. The apartment was quiet, so we could sleep with the windows open and hear the ocean but no noise from other apartments. You can hear noise from other apartments on the entrance side, but most sleeping rooms are buffered by the bathroom from any passing noise. The view from the balcony was fantastic, we spent most of the time soaking up the view and relaxing with the friendly cockies and parrots. The nearby pool was a little oasis in itself and it is great you can use other pools along Catseye beach. This apartment also came with two brand new golf buggies, which were very handy for getting around the island. We would like to extend our thanks to the entire HamoRent team for contributing to one of the best holidays we have ever had. Everything from the booking process to the airport transfers went very smoothly. It was also nice to find that the photos and descriptions of the apartment on the website were very accurate - if anything the view was even better than was shown in the photos. The level of communication was perfect at all stages. We would strongly recommend HamoRent to anybody considering a holiday on Hamilton Island. Our stay at the WE1306 apartment was incredible starting with the pickup at the airport from Lucas to the views and size of the apartment itself! Hamorent have been nothing but helpful with everything since the enquiry stages until check out and I will definitely be back soon (maybe this closer to Summer this time round). Already recommending a friend to book with Hamorent! Thanks guys!! Hi Team. From the 'meet and greet' at the airport to the final farewell, our stay was most enjoyable, especially the gorgeous views from the apartment and zipping around in the buggy you provided. We look forward to returning! I would like to thank you for a wonderful stay, from pick up at the airport to the last day everything was fantastic. The apartment was great, the outlook fantastic, when we were at home we spent most of our time on the balcony which was huge. The apartment had everything anyone could want for a great holiday. The location of the lodge was perfect, not right in the middle of the busy resort which is nice but within walking (or buggy ride) distance to everything. When we return to Hamilton Island we would definitly saty there again. Thanks agian for a great holiday. Hi there guys just want to thank you for a very pleasant & comfortable stay ! I was very pleased with the apartment / buggy & service & must say I am looking forward to going back ASAP !! If you have any 2 or 3 night vacancies for next month could you let me know & price too much appreciated. Yes that's how keen I am to come back! I could be back there sooner than you think ... I loved it that much !! We just left and had a great stay, loved the place, birdlife, buggy we'll be back again. Thanks for all your help and professionalism throughout. Most definitely you will see us again! We all agree it is the best holiday we have ever had. Thanks for everything. I'm very happy for you to put a testimonial up on your website - your service was brilliant. From the booking of the apartment through to being dropped off at the Marina to depart Hamilton Island, the Hamorent service was exceptional. Neri was incredibly helpful and accommodating from the outset, the Hamorent website was extremely helpful, and being greeted on our arrival with our buggy ready for us to drive was fantastic. It was the easiest holiday experience I have had - no stress - the Hamorent team took care of everything. I've been raving about our experience to anybody who will listen since we got back and we will definitely be returning and renting through Hamorent again. Thank you for a wonderful holiday experience! Thank you so much - they had such a great time and well looked after!! Service spot on. No Drama. A beautiful Island - good experience. Beach Magic. Ideal having the buggy. We arrived from a bareboat charter gone awry and at very short notice Lucas and the friendly Hamorent people found us a beautiful unit at a good price. They were much easier to deal with than the other agency we had used (who work from interstate offices) and we will definitely use Hamorent again for future visits to the island. I want to send a big thank you for letting me and family stay, it was beautiful and I'm saving up to come back. Thank you again. We have booked through HamoRent before and always find them professional and very accommodating and easy to deal with. Out apartment was fantastic. The owner should be very proud. We have used HamoRent 4 times previously, still happy. Loved every minute of our stay!!! The accommodation was so spacious and the best we've stayed at on Hamo! The view is by far the best I've ever had during my holiday journys. The set up of the room is so spacious and the art work is relaxing and homely. The wild life is gorgeous and really creeps up on you. I'm here with my family but will definilty return with my friends. The apartment nice, clean and spacious. As busy business owners, just to be able to relax with great uninterrupted views was magical. It was the energizer we needed. I would love to recommend the island and HamoRent to anyone. We love you as our friends and appreciate all you've done to make our holiday amazing. Thank you for allowing us to share in your piece of paradise. Craig, Bron, Luke, Kate , Liam and Ava. Great unit with plenty of room. Pools are all great and the weather has been fanatstic. Nothing seems too expensive and Whitehaven Beach was beautiful. The buggies are a great way to get around. We'll tell all our friends what a great place Hamilton Island is. Had a awsome time, will definitely be returning! Weather was beautiful most of the time. Buggies were heaps of fun too. My sisters wedding was amazing and the yacht club is beautiful. The views are gorgeous from the balcony. Best holiday I've been on and so sad to be leaving! Thank you for letting us stay in your apartment! The view is awesome and so is the beach. We had a wonderful time in all the pools and just can't wait to come back! Ps We love th buggy, they are fun and exciting to drive. Fantastic Location! Fantastic Buggy! Fantastic Time! Fantastic Company! Overall: Fantastic! Thanks so much for a fantastic stay! We have had a much needed break to start our 2 week holiday in QLD! Although this is 4th time on Hamilton Island we enjoyed it as much as the last time and will certainly return again. The buggy is great and Lucas and Neri have both been fantastic.